PRODUCT: NUISANCE DUST MASK / COMFORT MASK. 50/BOX. PRICE/BOX. 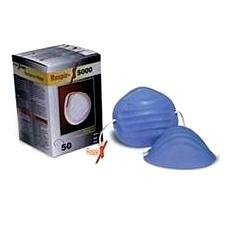 DESCRIPTION: Respir-X Disposable Nuisance Dust Mask / Comfort Mask. FDA Approved. Not NIOSH/MSHA approved. Use for comfort only - NOT FOR LUNG PROTECTION. affects of such nuisance dusts as pollen, common house dust, salt, and grass cuttings. NOT for use in spray painting, sandblasting, or working with asbestos. NOT for use against any toxic or hazardous dusts, such as, but not limited to, asbestos, pesticides, silica, stone dust, cotton dust. NOT for use against any fume, mist, gas, or vapor.